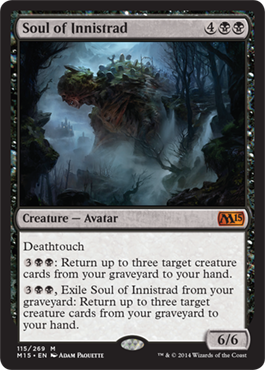 Soul of Innistrad is the fifth of six Souls in M15 and like the rest, it is a 6/6 for six mana, has an ability for its color (deathtouch), and then has two activated abilities, one for use while on the battlefield and one for use in the graveyard. This one is not the best, but if you had a dredge deck, you could return powerful creatures to your hand, even after Soul of Innistrad dies. 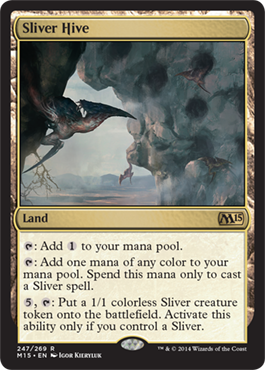 Our other spoiler today is a new Sliver land called Sliver Hive. It creates colorless mana normally but can create colored mana to cast Sliver spells. There is also an ability to put 1/1 Sliver tokens on the field as long as you control Slivers. Sliver Queen has a cheaper ability, but hey, it's still good for a Sliver deck. So, let's see... Slivers: Check. Sliver Land: Check. Garruk is B/G: Check, sort of... we'll see if he gets a real card. Enemy Painlands: We'll see, but there is actually a possibility of having 11 more lands because there is space, but we'll see.